i Click 'view all' to instantly compare this good deal with offers on other top deep fryers. Secura 1800W Large Stainless Steel Electric Deep Fryer Triple Basket is currently selling at $59.99, approximately $3.30 higher than average, giving a potential saving of $10.00 right now. With a lowest price of $50.99 and an average of $56.69 it is selling on the low end of its usual range. Price volatility is 0.89% (meaning it does not change often), so the price should stay low for a while. Right now this product is a recommended 'good deal'. Compare the current price, savings (in dollars & percent) and Buy Ratings for the top Deep Fryers that are closely related to Secura 1800W Large Stainless Steel Electric Deep Fryer Triple Basket. Here is how Secura 1800W Large Stainless Steel Electric Deep Fryer Triple Basket compares with other leading Deep Fryers. -No longer do you have to depend on fast food chains to have your favorite chicken wings, fish and chips, etc. Secura deep fryer have made deep-frying safe and convenient. 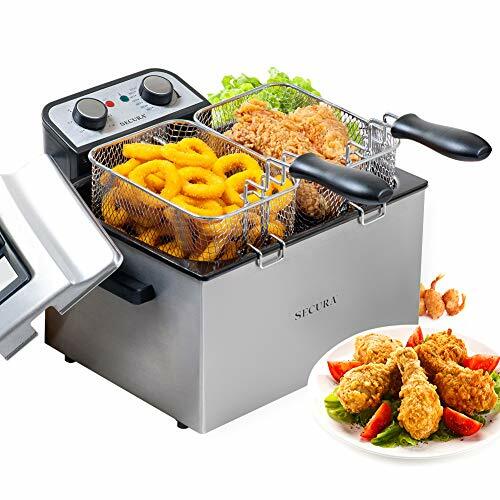 FeaturesProfessional Grade Electric Deep Fryer: Fry Fish And Chips At The Same Time. Secura cool-touch, stainless steel Deep Fryer comes with 3 fry baskets--one jumbo for big batches of finger-lickin' fried chicken or donuts, plus x2 side-by-side baskets for smaller batches of fish-n-chips, fries-n-onion rings, or for frying foods with different cook times.Adjustable Temperature and Timer Control: Adjustable heat control (265°-375°F). Automatic timer adjustable up to 30 min to shut down heating element. Ready light.Fast Frying: 1800 watt immersion type element preheats and recovers oil temperature fast. 4 liter large oil capacity gives you the ability to make food for your whole family, making it ideal for parties, movie nights, dinners and family gatherings. Big enough to fry 500g chips by one time.Safe To Use: Avoid hot splatters with the lid while still monitoring cooking through the view window. Basket includes hooks for easy, mess-free draining and can be lifted while lid is still on.